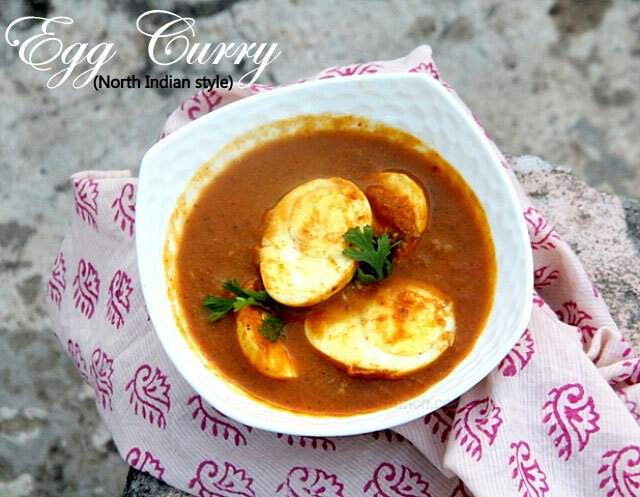 A North Indian, restaurant style masala egg curry that’s is smoking hot and spicy. 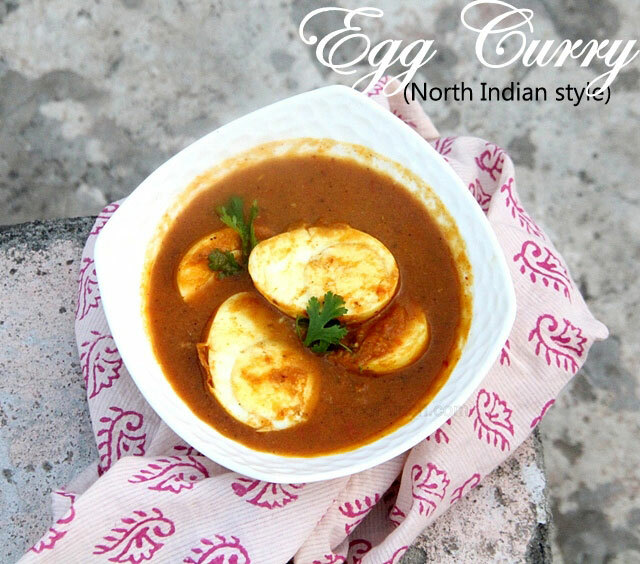 This egg curry recipe isn’t my first egg curry recipe, I know I have posted a few already like this one here, and here and here too. 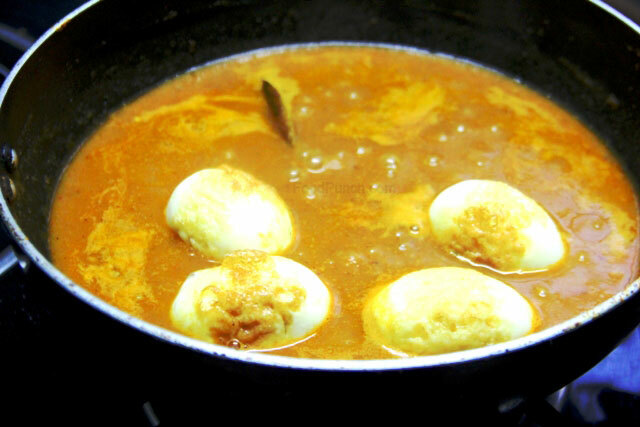 While the first link in the list, the creamy egg curry clearly is a different recipe but the other two, the Andhra style (Kodi Gudu Pulusu) and Bengali style Egg curries might appear quite similar to this one here which is a typical North Indian Restaurant (or Punjabi Dhaba) style egg curry recipe . 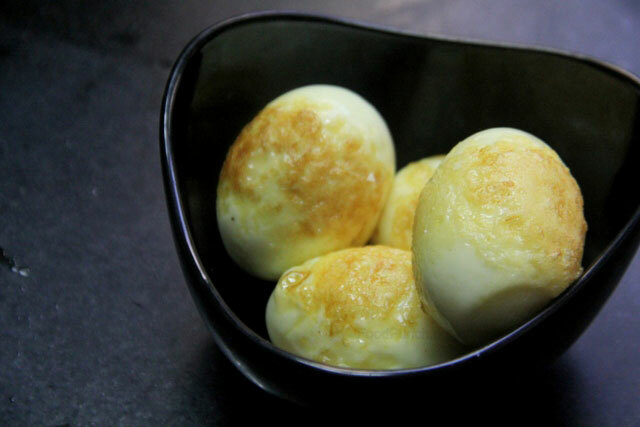 I mean there are some finer nuances and they will become pretty obvious if you look closer into each of these different styles of egg curry recipes. 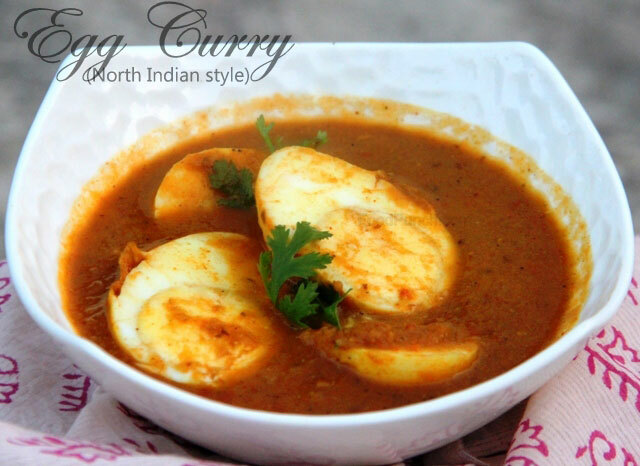 This egg curry that I am sharing today is spicy and hot enough to bowl you over. It is hands down our favourite preparation for a prized dinner on most weekends. A good egg curry recipe is also a savoir on days when you are out of stock on vegetables or just too tiered of eating the staple daal (lentil curry). 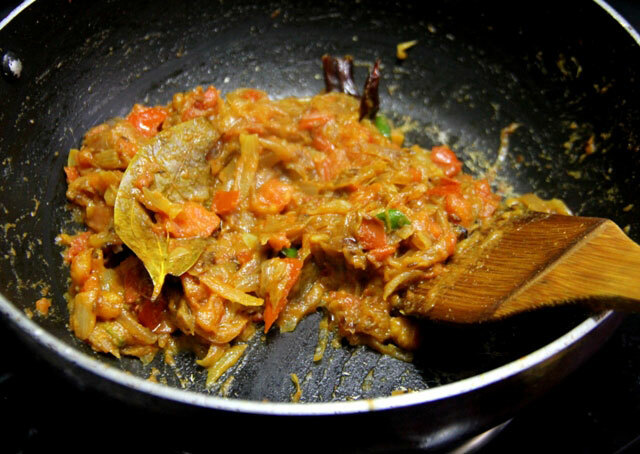 Heat the oil in a wok or Kadhai . 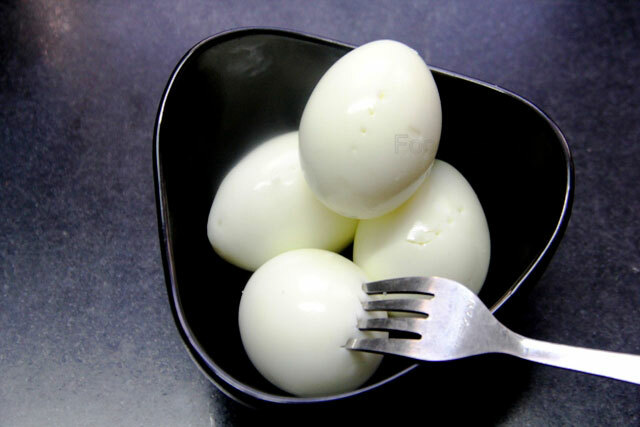 Prick each boiled egg with a fork or a sharp knife and fry them in the wok until golden all around. Be careful when you do this as oil may splutter rand burn, so add the eggs to oil and immediately cover with a lid for a few sec until the spluttering stop. Then remove give a stir and cover back and continue frying like this until golden, strain and keep aside. In the same wok (which would have enough oil left to fry the masala, add an extra tsp if required), add bay leaves, whole chilli, cumin seed, green cardamom, cloves and fry for a few secs. 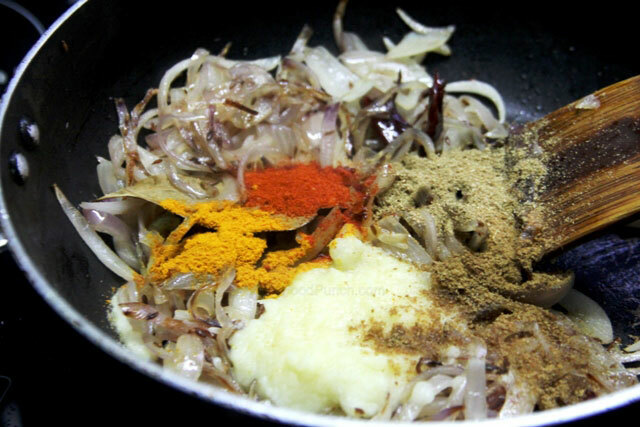 Add the sliced onions and fry until golden, then add ginger-garlic paste, turmeric, red chilli pwd, coriander pwd, cumin pwd and a little salt and fry for 3-4 mins on medium flame. 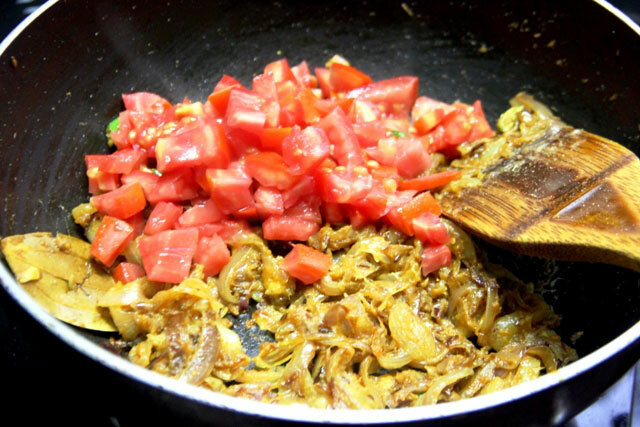 Then add chopped tomatoes and continue frying until a little oil starts to separate from the masala. 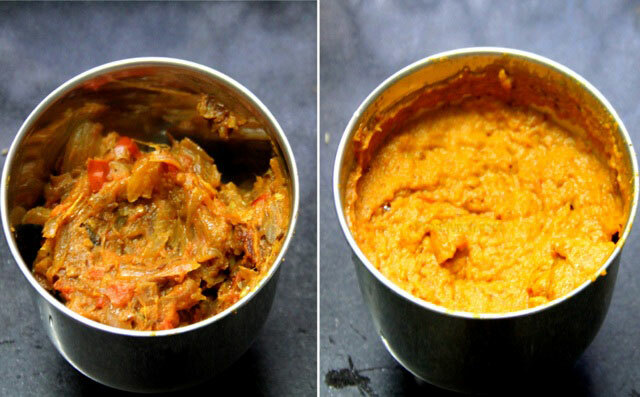 The turn off the stove and allow this masala to cool down a little, discard the bay leaf and turn the masala into a smooth paste using the food processor. Do strain the spices left in the wok with a little water and use it for gravy later. Now in the same wok or a fresh one add the ghee, a pinch of asafoetida, chopped green chilies and whole coriander seeds and let it just splutter. 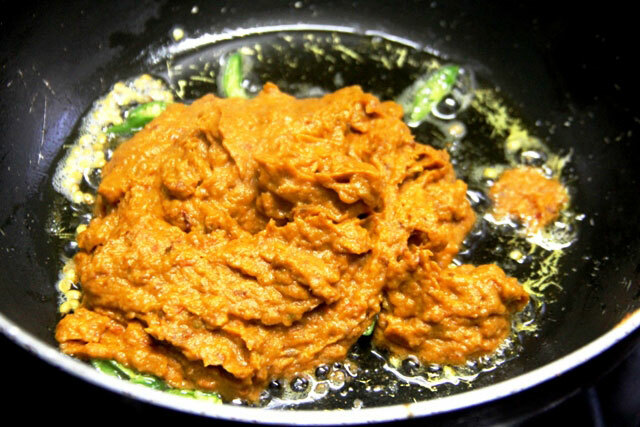 Then add back the masala paste and fry it on medium-low flame until oil separates from the spices. The add 2-3 cups of water including the retained spicy water earlier. 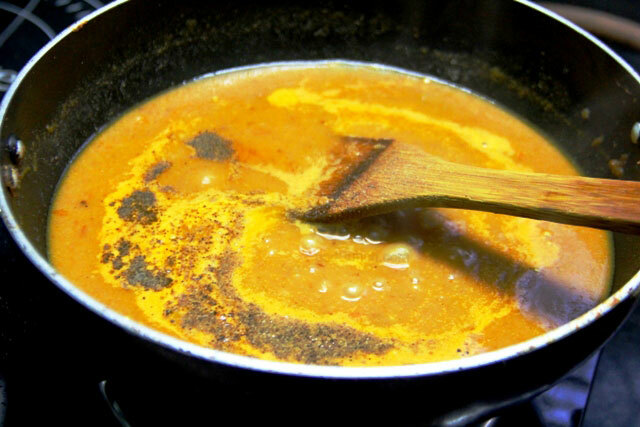 Bring the gravy to a boil, dress with black pepper pwd and garam masala pwd and allow simmering until the gravy thickens. Then adjust salt and once again prick the fried eggs with a fork (this will help some gravy to penetrate inside) and drop into the gravy, give one boil and turn off the heat. Keep covered until ready to serve. Warm up and serve with chapattis or rice with a garnish of coriander leaves. I like to cut the eggs into two lengthwise just before serving. 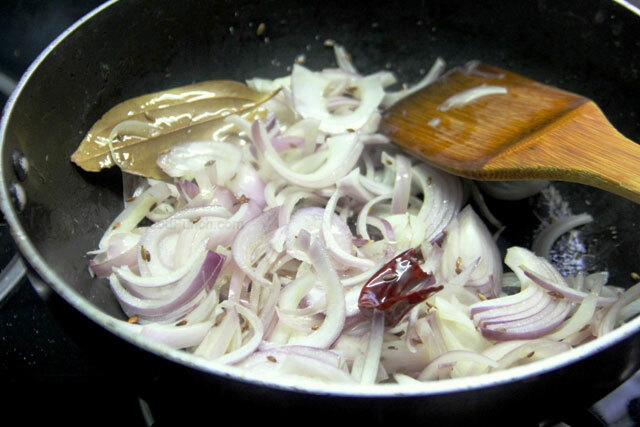 The recipe above will give you a really hot and spicy curry, so adjust spices to taste. Do remember to be really careful while frying the eggs. Hi sunny, thanks for trying the recipe… But we are still waiting to know how did you like the dish??? Short and simple…very nice recipe. Thanks a lot Shwetank.. I am really glad you liked it.. Thanks a lot M, so glad you liked it ..